We invite you to share your aesthetic concerns in a private consultation with our board-certified plastic surgeon, Dr. Theodore Foley. This is your journey to beauty. Dr. Foley and his team at Cosmetic and Plastic Surgery of Central Pennsylvania are dedicated solely to you and your beauty goals. Striving for excellent cosmetic results for all patients, Dr. Foley provides patients with exceptional surgical care founded in knowledge and years of experience in plastic surgery. We also pride ourselves in having a short scheduling time as our patients can be seen within 2 weeks of booking. Transform your facial features with cosmetic or reconstructive surgeries of the face with natural, gorgeous results. Achieve a more balanced figure with breast surgery that lifts, enhances, reconstructs, or reduces your bust line. Discover body contouring procedures that eliminate stubborn fat, tighten loose skin, sculpt your torso, legs, and buttocks. Enhance the form and function of your hands with hand surgery if you have impairments, pain, or experienced trauma. Rejuvenate your skin with our MedSpa treatments that brighten up your skin, plump your lips, or remove unattractive body hair. When you are not ready to have an invasive surgery, we have nonsurgical procedures that can help defy the signs of aging skin. 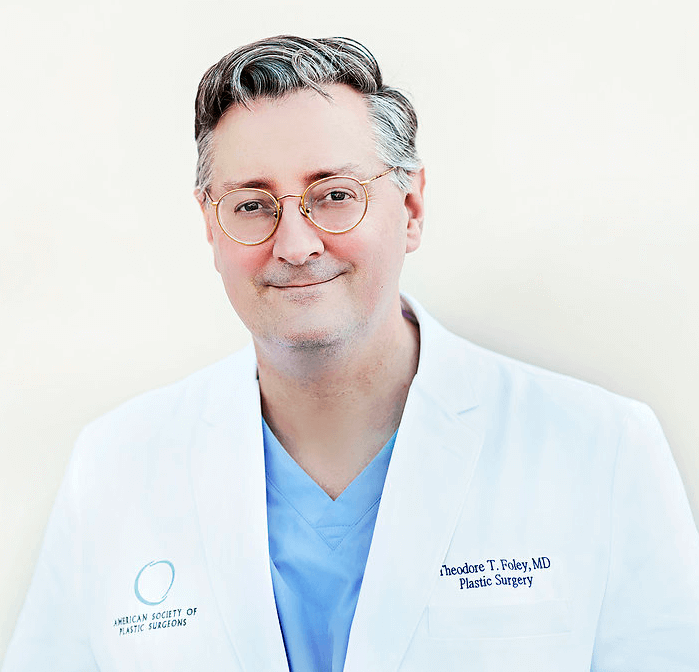 Meet our board-certified Plastic Surgeon, Dr. Theodore Foley of Cosmetic & Plastic Surgery of Central Pennsylvania. He provides the greater Harrisburg, PA area with cosmetic and reconstructive procedures of the face, breast, body, skin, and hands. Our patients receive excellent surgical care founded in knowledge and experience. Dr. Foley treats each patient with compassion and as a precious pearl to cultivate to the highest form of transcendent beauty. Whether your needs be reconstructive or cosmetic, our practice will provide you with the highest quality of private surgical care with sensitivity and respect. From breast augmentation, carpal tunnel repair, tummy tucks, breast cancer reconstruction, mommy makeovers, and more, Dr. Foley is an excellent choice in plastic surgeons. He also leads an aesthetics team who strive to give our patients the very best experience from the moment they call and come into our office in Harrisburg, PA. The Aesthetic Society is the world's leading professional organization of board-certified plastic surgeons who provide exemplary surgical outcomes. As a member of the prestigious association, patients can rest assured that Dr. Foley's sole focus is to provide outstanding results that exemplify the society's mission. Best plastic surgeon in the area! After exploring several options, I chose Dr. Foley because he was very qualified and knowledgeable. He was caring, professional and did a great job. He talked me through the procedure step by step. His staff was amazing and caring as well. He made sure I was pain free the entire time and put me at ease. I would highly recommend him to anyone seeking plastic surgery. Dr. Foley is very knowledgable and looks our for your best interest! I got referred to this doctor by a friend. I was very pleased with the staff and their professionalism. The doctor is very patient, he listens to your concerns and questions and answers them in a way that can be understood by just a regular person. I am going for a second procedure soon, my husband and I feel very confident in this place. Dr. Foley is an extremely kind and compassionate doctor. I highly recommend him and his wonderful staff. They are most wonderful people I have ever met. Doctor Foley is excellent. If you are looking for a Plastic Surgeon and Cosmetic Doctor look no further. He operated on my husbands leg that had a hole in it. Took a muscle from the back of my husbands leg and pulled it up in the hole and did a skin graph to cover. Thank the the Lord for this man, he is out of this world. A lot of healing time and recovery but otherwise he would have lost part of his leg. Miracle Worker. Cosmetic & Plastic Surgery of Central Pennsylvania is a plastic and reconstructive surgery practice near Harrisburg, PA, that offers surgical and nonsurgical cosmetic procedures. Dr. Foley and his professional and dedicated staff are honored to be serving the greater northeast area with exceptional cosmetic care. Our practice will work closely with you to understand your cosmetic needs and goals to provide a unique treatment plan that is ideal for you. We take pride in our work and treat all our patients like family. With a state-of-the-art facility, a highly-trained staff, and a wide range of cosmetic procedure, our practice is able to provide safe quality care. We invite you to read through our patient reviews, view before and after photos, and tour our facility to learn more about our practice. Read reviews about Dr. Foley's exceptional surgeries, techniques, calm bedside manner, and more. See Dr. Foley's patient "Before & After" photos in our cosmetic and reconstructive procedure gallery. Enjoy monthly specials on chemical peels, skin consultations, SkinMedica® products, and more! Cosmetic Plastic Spa provides our patients with personalized treatments in an innovative space.